It’s that time of the year again! Yes, pomegranates are in season which means it’s time for Pomegranate Week here on MPK! I can hardly believe that this is the third year that I am featuring Pom Week!!!!!!! 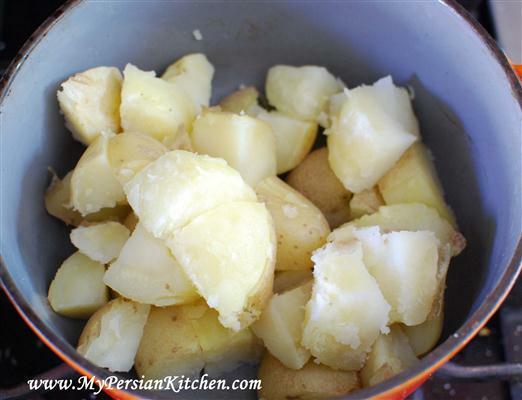 Today on the menu we have a super easy and simple side dish. 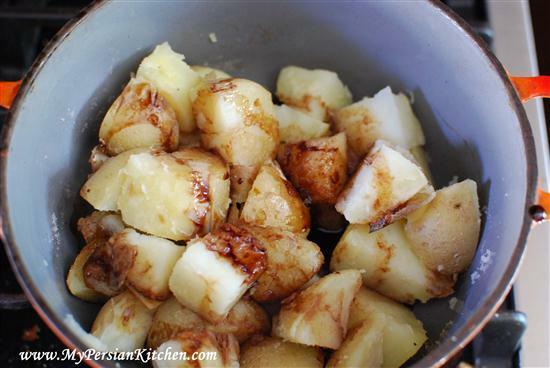 A few years back I was at my cousin’s house, who goes by the name of Hungry Tiger around here, and he made delicious potatoes that were tossed in pomegranate concentrate. It was love at first bite. I duplicated the recipe to the best of my memory of it. 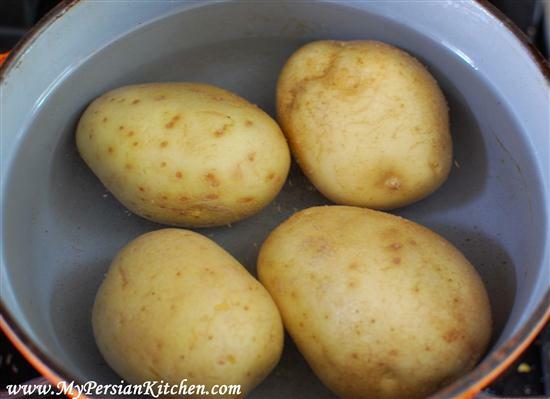 Cook potatoes in plenty of water seasoned with salt until just tender. 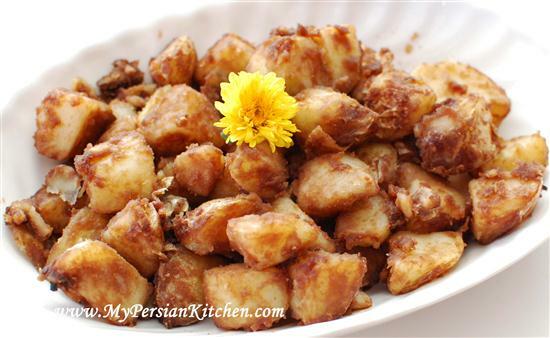 Cut cooked potatoes into large cubes. Place back in the same pot that they were originally cooked. Turn flame on medium and add pomegranate concentrate or syrup. Season with salt and pepper. 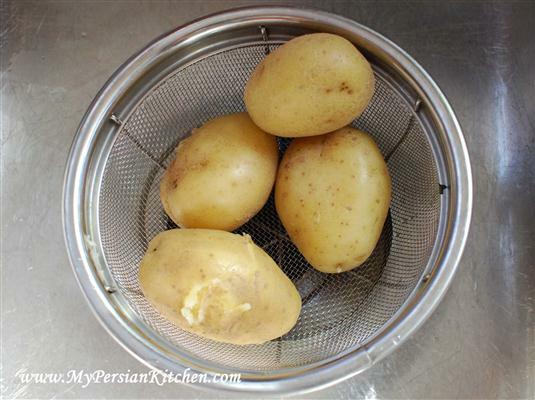 Gently toss potatoes until completely coated with pomegranate concentrate. Serve warm with Pan Fried Chicken with Persian Spices for a delicious meal for 4 all cooked in just about half hour! I have to confess that when I served these potatoes the Sous Chef nearly lost his mind…not in a good way. Apparently, I didn’t know that there is such thing as a “Potato Law” and I royally broke it. The Sous Chef thinks that pomegranate and potatoes just don’t go together. I on the other hand loved these potatoes and my taste buds were doing a happy dance for the rest of the day. For those of you who will make this recipe, what’s your take on it??! 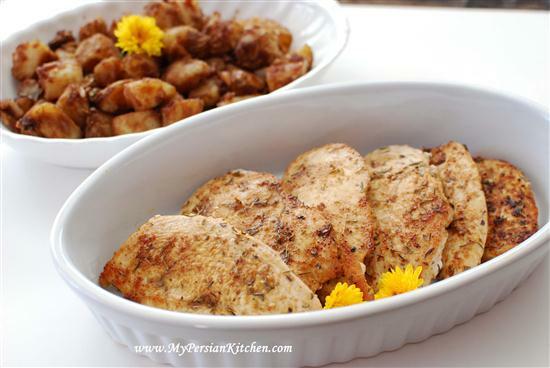 I just made these potatoes and the pan fried chicken – they were both delicious! I sprinkled some dried mint on the potatoes – it added a tiny bit of flavour to the already delicious potatoes. Irene, I am so glad you liked them both!! I realize you posted this recipe over a year ago, however, I just made it today. It is amazingly delicious!! My husband and I both loved them. I have some leftovers, and I’m wrestling with my inner fat girl over whether to eat them now or save them for later when I’m actually hungry.